LoopLink RLC now allows for an economic analysis to be performed that compares a new GSHP to an old one that is ready for replacement. By doing so, we allow the system designer to illustrate the benefits of upgrading to a new GSHP unit from an economic point of view. Units that were installed in the 80's and 90's are most likely near the end of their 25-30 year life expectancy. If you couple that with the fact that newer GSHP units are quieter, more reliable, and more efficient than they were 20-30 years ago, you may find yourself on the receiving end of sales contract to replace a unit. 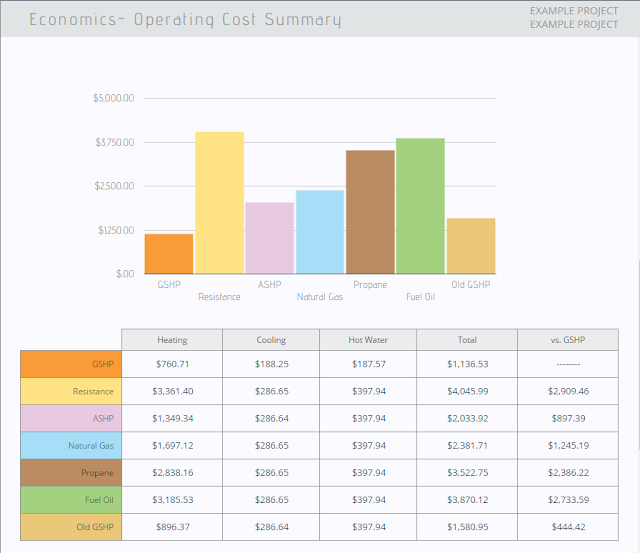 The new option is included on the Operating Cost Summary and Cost of Ownership pages. To perform an economic analysis that includes the estimated operating cost and long term cost of ownership for an older GSHP, you must first check the box to activate the option from the Operating Cost Summary page. The performance of the old equipment is described by the operating efficiency you specify just as it is for the other comparison technologies. If you have actual operating efficiency averages for the past year (there are homeowners that check) you should use that information. Otherwise, using the old rated efficiency should get you close. 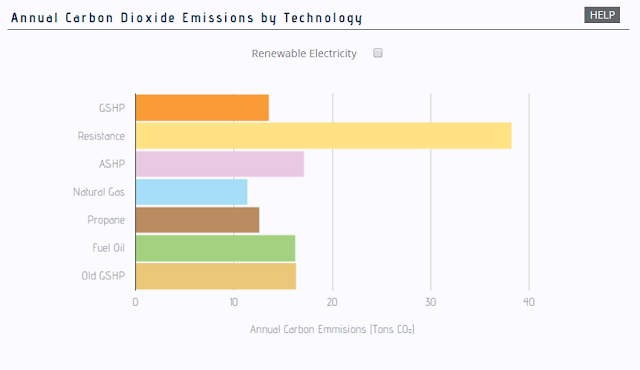 The Annual Operating Cost by Technology and Annual Carbon Dioxide Emissions by Technology graphs will update accordingly as you make changes to the technologies to comare and their operating efficiencies. After activating the option, you will also be able to perform a long term economic analysis on the Cost of Ownership page to show simple payback as well as long term operating and ownership costs.